One of the most surprising developments in evangelicalism in recent memory came out of Willow Creek, one of the largest and most influential megachurches in the United States. A few years ago their pastor, Bill Hybels, had made public his desire to retire from leadership and was working through a plan to hand the reins over to the next generation of leaders. He announced on October 14th that his successors were a pair of pastors, teaching pastor Steve Carter and executive pastor Heather Larson. This marks one of handful of times that such a well known and trend setting evangelical church has been lead by a female pastor. When it came to looking for actual data on the question of support for women in the pulpit, the options are scarce. One instrument, the Faith Matters Survey, was pointed out to me by our fellow contributor Paul Djupe. The survey was conducted in 2006 in support of Putnam and Campbell’s book American Grace, and has a sample size of 3,100 respondents (all results will be reported with survey weights). It turns out they asked the same question again in 2011. 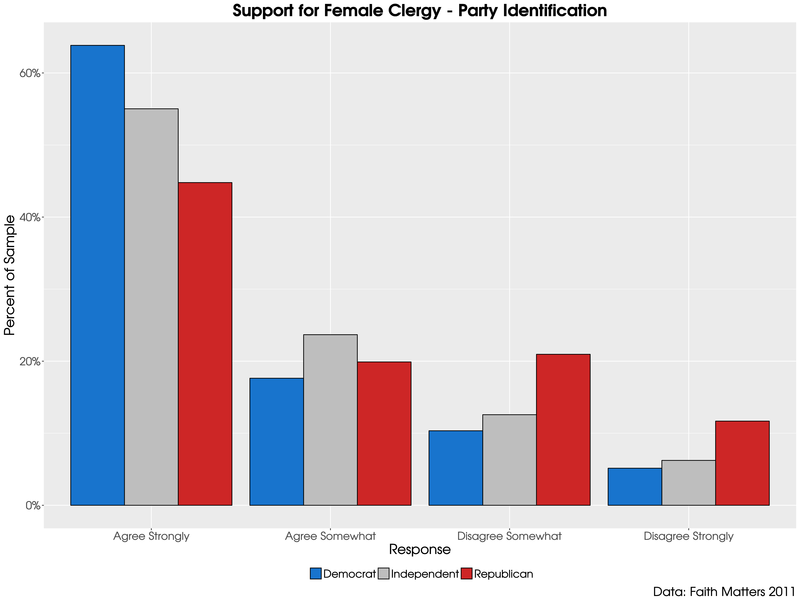 The question was posed as a statement: “Women should be allowed to be priests or clergy in my house of worship.” Respondents were allowed to respond in a range from “agree strongly” to “disagree strongly”, or that they “didn’t know/didn’t have an opinion.” Overall, support for female clergy is strong among Americans – 77.7% of respondents indicated a positive reaction to the concept of women leading churches. Strong disapproval in 2011 stands at just 7.2% – less than half of what it was in 2006 (15.6%). It’s important to note that this is for the entire sample, not just those who indicate a religious preference. So, I wanted to focus more closely on Christian traditions that are widely known to prohibit females from holding leadership positions, the aforementioned Southern Baptist Convention and the Roman Catholic Church, whose Catechism 1577 notes that, “ordination of women is not possible.” I’ve also included a mainline denomination, United Methodists, as a reference category. Even in these two conservative traditions, the laity are strongly in favor of women filling the pulpit. Strong majorities are in favor of women being in leadership for both SBC (64.5%) and Catholics (68.9%). This should not be surprising given the deep divide on other issues related to gender equality. For instance, in the Catholic Church, 82% of churchgoers believe that using birth control is morally acceptable even though the official position of the church is opposed to the practice. However, to my knowledge, there has been little survey research to plumb the depths of this divide among Southern Baptists, but this piece makes a solid case that SBC elites are becoming less supportive of birth control. I also wanted to look at differences between male and female respondents regarding the issue. The divide here is small, but one result is striking. According to these results, female respondents are more likely to disagree with the concept of female clergy than male respondents. The difference is small (~4%), but is worthy of some reflection. There has been some work in social science that indicates that women attending conservative churches are more likely to maintain positions of biblical literalism. The reasoning behind this, as Andrew Village writes, is, “Women compensate for the lack of access to institutional social resources (leadership) by stressing the accepted schema (literalism) more strongly than men.” This seems to be made manifest in these results. Given the degree of cultural change in American society and religion, it would be surprising if acceptance of women clergy was not more common among the young. And so it is as the figure below shows. The story is that the gap is not greater. Younger respondents have a more favorable opinion, while older individuals are less receptive to the idea. However, these differences are small with the youngest group only being 6% more supportive. With (small) gender and age gaps, it would be almost impossible for there not to be differences linked to party identification and views of gay marriage. The results were as expected. Republicans and those who were opposed to gay marriage were also less likely to support women pastors. One potential reason is that women clergy are more liberal and are more likely to take up issues traditionally considered to be “women’s issues” such as education, the family, and gay rights as previous work from Laura Olson, Sue Crawford, and Melissa Deckman has found. Finally, I analyzed how church attendance is linked to views on the topic. The Faith Matters survey gives respondents multiple options to report their religious attendance. Here the opposition to female clergy comes more sharply into focus.Those who attend church often are less supportive of female clergy. Among those who attend religious services multiple times a week, 42.7% are unfavorable toward women in church leadership, which means that even amongst the most faithful, female clergy has majority support. Throughout all this analysis, this is the group that stands most clearly in opposition. To take a step back, I was amazed at how my perceptions of opposition to female clergy do not square at all with the survey evidence. It seems that the only voices that represent those of the Southern Baptists and Roman Catholics are the clergy, while the congregants stay silent in their disagreement. This may be due, in some part, to the spiral of silence that occurs when individuals are afraid to speak up in opposition, and therefore leaders assume that everyone agrees with their position. However, it’s clear from this data: most of the American public has no problem with women leading religious congregations. And this is yet another issue where a highly religious, older set is out of step with American society. It is no surprise that Pope Francis has sent positive signals about the involvement of women in the Catholic Church (though shut the door firmly on women priests). There are high profile women in non-denominational pulpits with huge twitter followings. Will Protestant denominations follow suit? Next Are Millennial Evangelicals Going to Change the Narrative?